The Big Wobble: Four massive fish die off's along Long Island and Jersey shore in just a week: Authorities blame lack of oxygen but only one species effected? Local people who have lived there for years claimed they had never seen anything like it before. Well it turns out this incident was just the tip of the ice berg, more fish are washing up dead in New Jersey waters. App.com reports, for the second time in less than a week, thousands of small bait fish called peanut bunker have washed up dead along the Jersey Shore. The first time was Tuesday in Keansburg on the northern shore of Monmouth County when millions of peanut bunker died and the second time was Saturday in Little Egg Harbor Township on the southern shore of Ocean County, a geodesic distance apart of 65 miles. A conservative guess of 20,000 of the little fish were said to be dead. Once again the cause of death is believed to be due to low concentrations of dissolved oxygen in the water, said Bob Considine, a DEP spokesman. 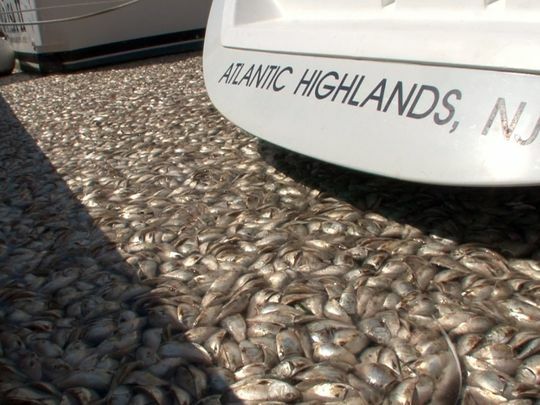 The next day the latest in a series of fish kills throughout the Jersey Shore was reported when thousands of dead fish in a marina in Atlantic Highlands washed up dead on Sunday. Blake Deakin recorded aerial footage of at the Atlantic Highlands marina, where thousands of what appeared to be dead peanut bunker floated lifeless around moored boats. "I came across it (Sunday) morning," said the 34-year-old Atlantic Highlands resident. "It was starting to smell pretty bad. It got noticeably worse over the course of the day." Once again the cause of death is believed to be due to low concentrations of dissolved oxygen in the water. On the same day a few miles further north authorities reported thousands of dead bunker fish washed up on shore on Long Island. Huntington Town officials told Newsday some 11,000 bunker fish entered Mill Pond in Centerport last week and became trapped after the tide went out. He says it’s the largest fish kill in the town since a mass die-off in Cold Spring Harbor 30 years ago. A Department of Environmental Conversation says the exact cause of the die-off is unclear. But he says such events occur in warmer months when oxygen levels are low and the energy used by fish increases. In Atlantic Ocean,there could be high bacteria called Red tide.if there confirm high bacteria count,that might be what killing fish.